I’ve somehow managed to not do any sewing for the last few weeks. This morning I had a few hours free, with husband out of the house and nothing to do until lunchtime. I got out the pattern pieces and fabric for the Burda pattern I’ve been intending to make…looked at them and put them back in the cupboard because I couldn’t bring myself to cut the pattern out of my good fabric. Despite having gone to all the bother of tracing the pattern, making a muslin, making a new copy of the pattern with corrections on it I think I’m giving up on this project. Something about the dress just isn’t grabbing me. So I decided to start on my kimono instead. I had a brilliant kimono dressing gown years ago that I wore until the fabric shredded, and I’ve always wanted another. I bought fabric for this a few weeks ago at Karen’s Fabulous Fabric Fandango on Goldhawk Road. It’s the multicoloured cotton one on top of the pile. Having measured myself (and my fabric) I came up with this layout which will fit on 45″ fabric and hopefully produce a kimono big enough to go around me. I’m a lot wider than the average Japanese lady! I haven’t really worried about seam allowances. I shall make them as small as I can and hope it works out. Kimono are supposed to have tiny seams anyway. The broken lines on the diagram are fold lines where the garment hits the shoulder. My fabric doesn’t have much of a selvedge, although there is a manufacturer’s name printed down one side that reduces the patterned width of the fabric to about 44″ from the full 45″. I am going to use the unpatterned bit in the collar piece, which can be reduced in width slightly without breaking anything, and in the hem of the sleeves where it will be folded under. That diagram is probably only going to make sense read in conjunction with http://fibers.destinyslobster.com/Japanese/Clothes/japmakekimono.htm which explains how all those pieces go together. Then it was just a case of drawing the layout on the wrong side of the fabric with chalk and chopping away with the scissors. A rotary cutter would been even easier but I didn’t think of that until I’d started cutting. I have to say this fabric was perfect for this style of constructing shapes directly on the fabric. The pattern has lots of perfectly horizontal and vertical lines of symmetry which made it really easy to mark the lines without doing a lot of measuring. I’d have gone insane with something like my skull print fabric where what appear to be vertical lines of symmetry are in fact very slightly slanted. A complete accident, but something I’ll try to remember for the future. Of course the proof of all this will be in the sewing, which I haven’t actually started yet, but I’m really pleased I’ve got some pattern pieces cut out at last. Even if they’re all rectangles. Posted on June 12, 2011 June 14, 2011 by catherinedaze	This entry was posted in Cutting, drafting, dressmaking, Fabric, Kimono, sewing and tagged Cutting, dressmaking, fabric, kimono, sewing. Bookmark the permalink. Oooh, very excited to see how this turns out. 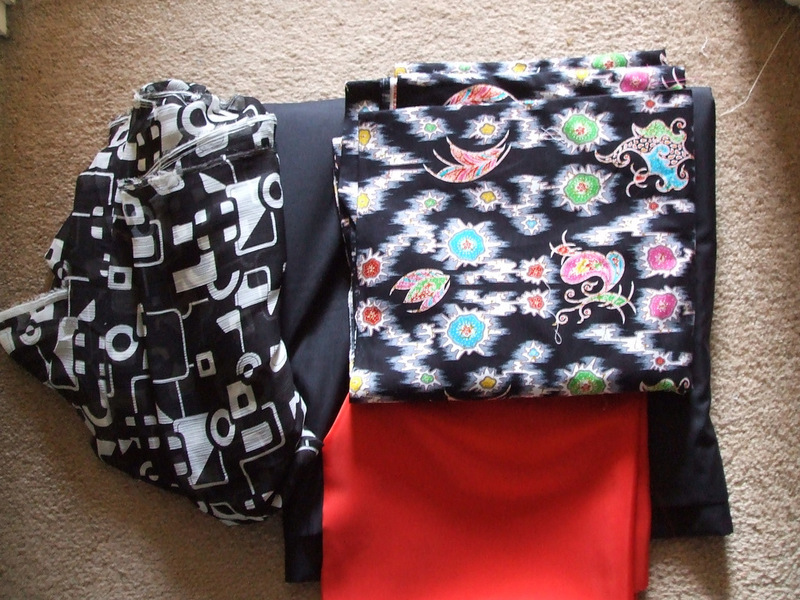 Didn’t realise kimonos were just a bunch of rectangles – makes it seem so easy! If yours is as easy as it sounds, I might just have to give it a try myself. You are going to look AMAZING in a kimono. I can imagine it suiting your figure so well. The fabric is perfect, also. Do let us know how you get on – I’d love to make a kimono one day.